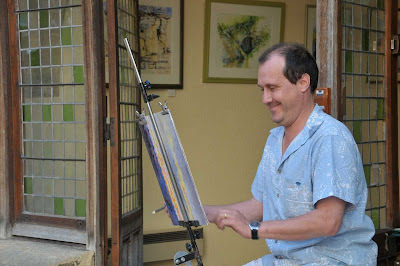 Here some photos of me drawing on the gallery door by the Sarlat photo-blogger Libiza. 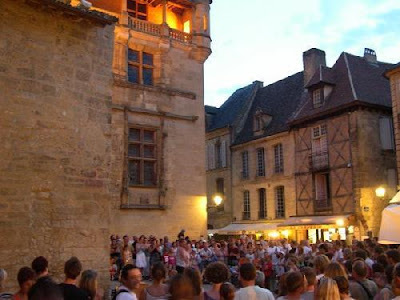 And here are some photos of me taken by another Sarlat photo-blogger, my long-standing blogging buddy Boguy. As you can see sometimes I drew on the street & other-times I hid myself behind a window . It was a real pleasure to meet them both in the flesh at the expo. ‘Proximity’ blogging is great for putting people with similar interests together. Both their photo-blogs are a great place to start ‘visiting’ the Dordogne & enjoying quality photography. Soon,I will create a link list on this blog of SW France bloggers whose blogs I enjoy. 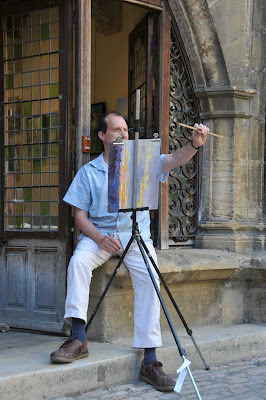 Here’s a photo by Boguy of the Cathedral Square (Place de Peyrou) to give you an idea of what I was drawing….Some twenty or thirty drawings to published here over the next few days. mug shot…good practsie at smailing? Merci Adam pour ce reportage et heureux de se trouver en si bonne compagnie, bravo pour les dessins!